Venture Deep Ocean highlights recent discoveries about seafloor volcanoes and hydrothermal vents, and the uniquely specialized organisms that inhabit these extreme environments. Site materials include feature stories that are updated periodically and an image gallery with illustrated articles, slideshows, and a featured image. 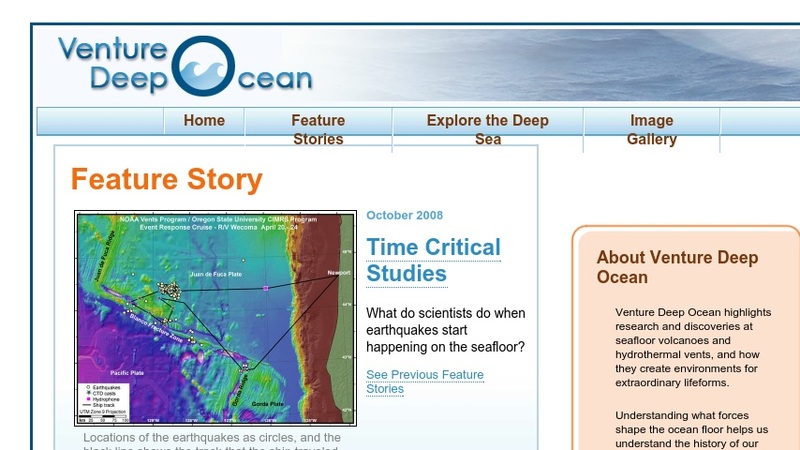 There are also tutorials on deep-sea exploration that cover volcanoes and vents, life in the deep, expeditions to explore the deep sea, and some of their tools and techniques. Other materials include links to news articles from other websites and a brief overview of the organization.